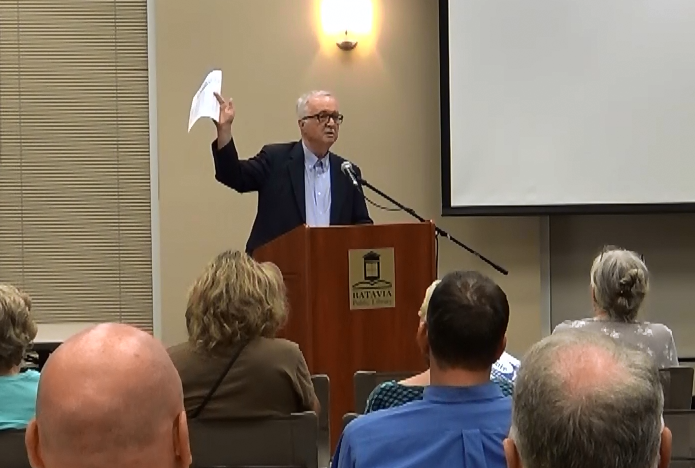 Jim Tobin, economist and President of Taxpayers United of America gave a presentation on how Home Rule affects taxpayers. Mr. Tobin has spent decades fighting home rule throughout Illinois, calling it, “the most insidious form of government in America”. In some cases, Home Rule even takes away citizens’ right to vote on vital city issues and limits citizens’ voice in government mayoral and council elections. “Taxpayers are effectively muzzled, except at election time, and even then, their choices are limited,” according to Tobin. The Illinois version of so-called Home Rule strips citizens of control over local politicians’ power to tax, to regulate, and to incur debt. The Illinois version denies citizens the right to have a local charter or constitution to protect taxpayers from abuse or incompetence by office holders and from the hazard of easy access to public funds for developers, lawyers, bankers, and government workers. Illinois bypasses the people of the community and puts all the power of local government into the hands of politicians. That’s why students of government and political science have described the Illinois version of so-called home rule as the most insidious form of government anywhere in the United States of America. It is government by personality instead of government by principle. 1) Raise taxes without citizen permission. 2) Impose new taxes in the form of fees, licenses, and regulations. 3) Expedite seizures of private property. 4) Give city property to private interests without competitive bidding. 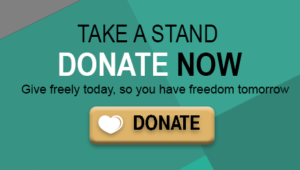 5) Take greater control over citizens’ lives, livelihoods, property, and liberty. This story has been featured by CBS and NBC. Click here to view the CBS report, and click here to view the NBC report. 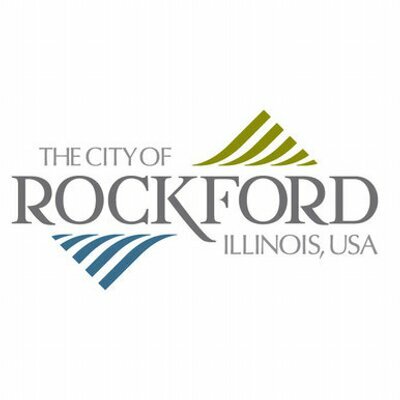 Rockford – Taxpayers United of America (TUA) today released the updated study on Rockford, Illinois government employee pensions, publishing the top 200 pensions for Rockford Illinois Municipal Retirement (IMRF) fund and the top 200 pensions of the Teachers’ Retirement Fund (TRS). “Rockford taxpayers, like the rest of Illinois, can’t afford to pay for outrageous pension promises made decades ago by greedy political hacks. These pensions are nothing more than a contract for union votes and have nothing to do with providing services to taxpayers,” stated Jim Tobin TUA’s president and former economist. “The teachers’ pensions are some of the most outrageously lavish in the state and gubernatorial candidate J. B. Pritzker is on his way to bail them out at the expense of Illinois taxpayers. If Pritzker is elected governor, he will quickly slam taxpayers with a huge increase in the flat-rate state income tax. Then, he will support the Income Tax Increase Amendment, which would create a graduated income tax increase for middle class taxpayers. “Illinois is first in the country in outmigration; more taxpayers are moving out of the state than into the state. That means that those of us who stay will have to pay even more in taxes to bail out the lavish, unnecessary government pension that have bankrupted Illinois,” added Tobin. 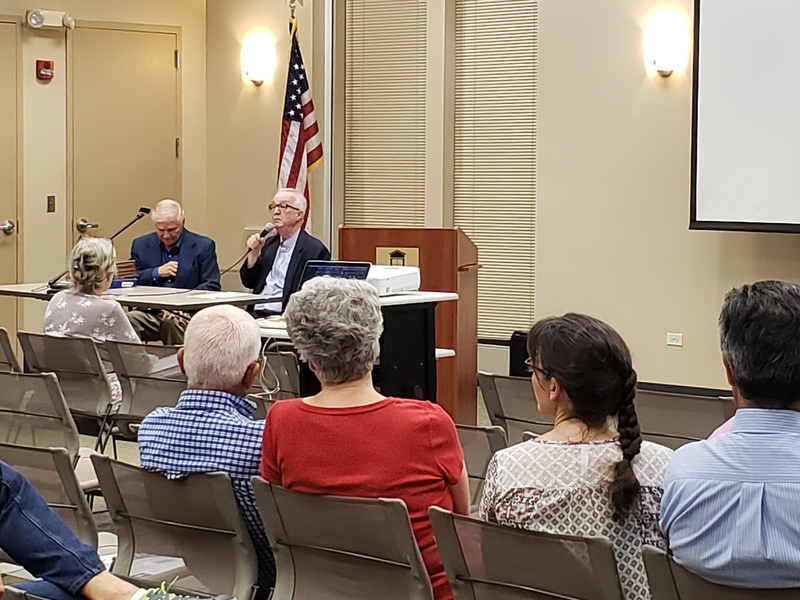 “It is just unreasonable to allow people to retire in their 50’s and early 60’s and expect taxpayers to foot the bill, and if Madigan gets his way and Pritzker wins the governor’s race, government pension reform won’t occur anytime soon,” concluded Tobin. CHICAGO—A recent Chicago Tribune article called attention to Chicago’s having lost 3,825 residents last year and 4,879 residents in 2016, and to the fact that Chicago metropolitan area lost residents for three consecutive years. 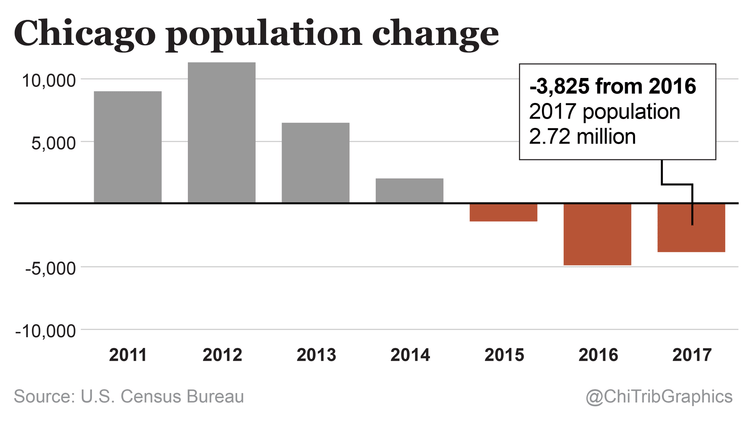 Illinois dropped from fifth-most populous state to sixth-most populous state in 2017. 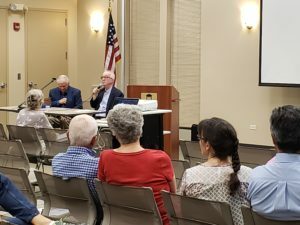 The article, Chicago population still tops Houston’s, described the population losses as a “trickle,” and added that “experts are trying to figure out why,” noted Jim Tobin, president of Taxpayers United of America, headquartered in Chicago.